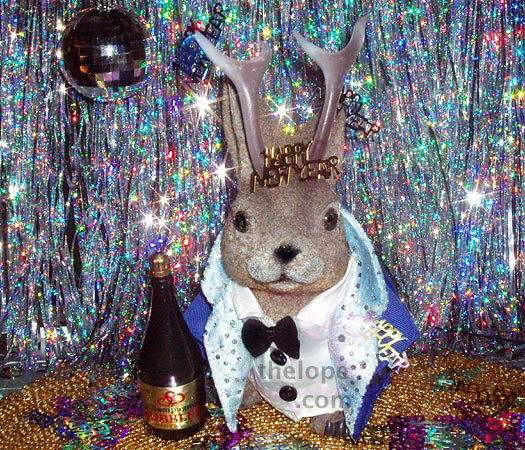 The Lope: Happy New Year, 2008! Thanks for riding through 2007 with us! We have a bunch more Christmas stuff to go, as we've decided it's Christmas 'til either Epiphany or until Target Stores finish clearancing their Christmas stuff at 90% off. I guess that covers the sacred and the profane (or at least the traditional and the materialistic). And, for those of you who feel Yule trodden, we'll have some stuff that involves no lights or tinsel. And, yes; we've used this photo twice before. It's kinda hard to recap the year when you're still living it in fast-forward, especially as Ace is already off partying (non-alcoholically, of course). He also wasn't crazy about posing for another holiday picture just yet (something about disruptive cats). We should be able to have something entirely different up tomorrow.